Ti bikes have always held a special place in my heart. My aunt and uncles owned a bike shop in Northern California, and my cousins and I grew up together in the shop. I was a pretty mediocre mechanic, but I learned a lot about the basics, from wheel truing to tuneups, from overhauls to the rules of right and wrong for componentry or frame selection. The shop sold Treks, Kleins, Gary Fishers, and always had a couple Lightspeed titanium bikes on the wall. 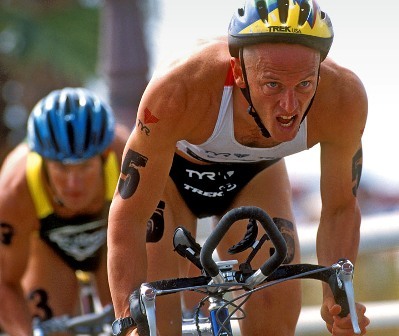 Local multisport legend, family friend, and frequent customer Mike Pigg was sponsored by Trek (anyone remember the Y-Foil? ), which was cool, but the best, most dedicated riders in the area rode Litespeed. Arcata may be in California, but its climate is firmly Pacific Northwest, so the durability and feel of Ti just made sense. My goodness did I want one, with all the OG polished Dura-Ace fixings. So with our recent Moots announcement, I’ve been aggressively planning my next bike. It’ll be a Vamoots Disc RSL, set up for crit racing. I’m stoked. In the meantime, though, I learned that ACME had a floor demo model Routt in my size, so...I had to get it. 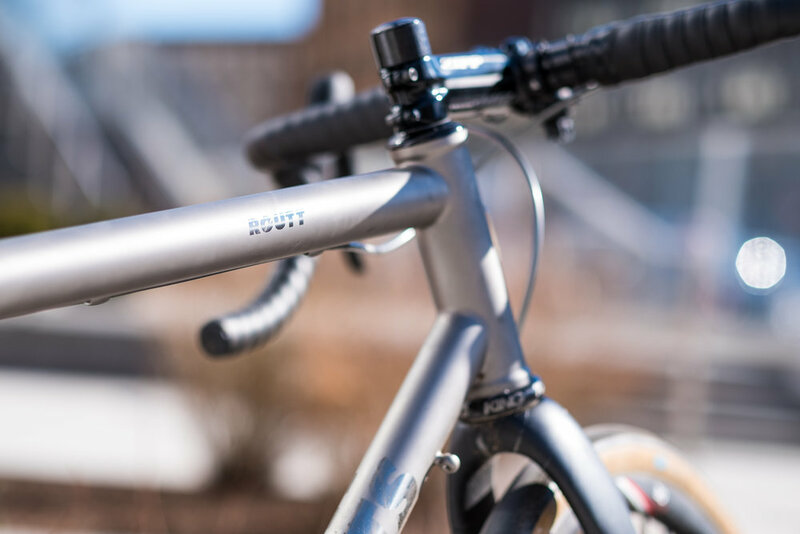 “Routt” designates Moots’ wide-tire do-it-all bikes: not as long or low as the Vamoots; room for 38s (or more); not as twitchy up front as their Psychlo-X cross bike, and with a BB drop tuned for bombing descents and railing corners, instead of pedaling through them'; fender mounts, with room to use them. You get the picture. 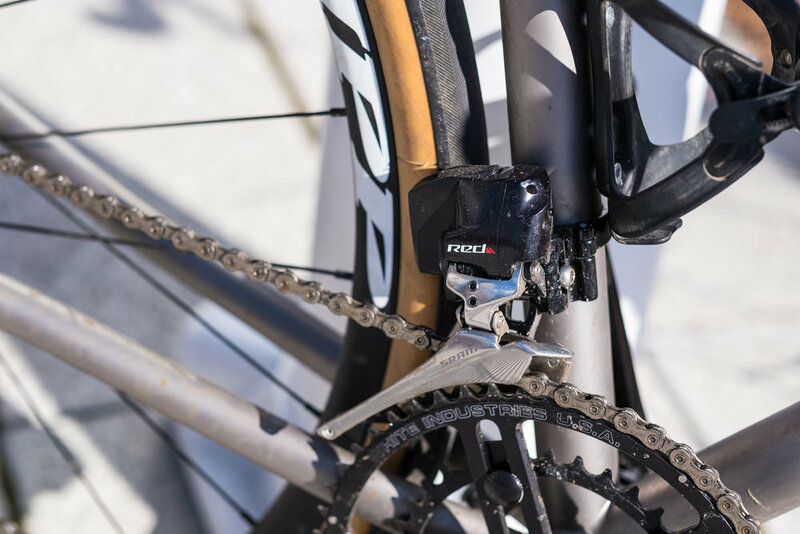 Moots make a wide-clearance version (Routt 45), a gravel racing version (Routt RSL), and a...regular? version, which I now own. It’s got polished logos, which I didn’t know I’d like, but now that I’ve looked at them for a few days...damn. It’s the only choice, IMO. 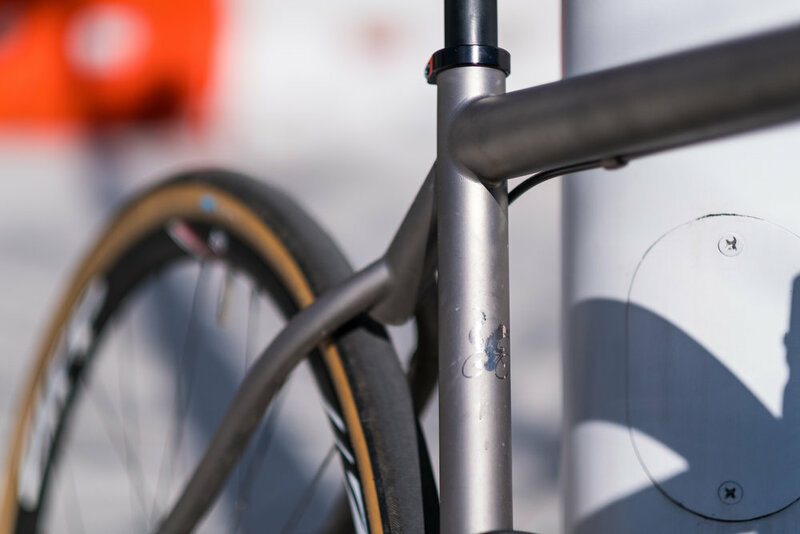 I mean, these bikes are forever bikes, so it makes sense to pick a finish that’s not going to go out of style anytime soon. 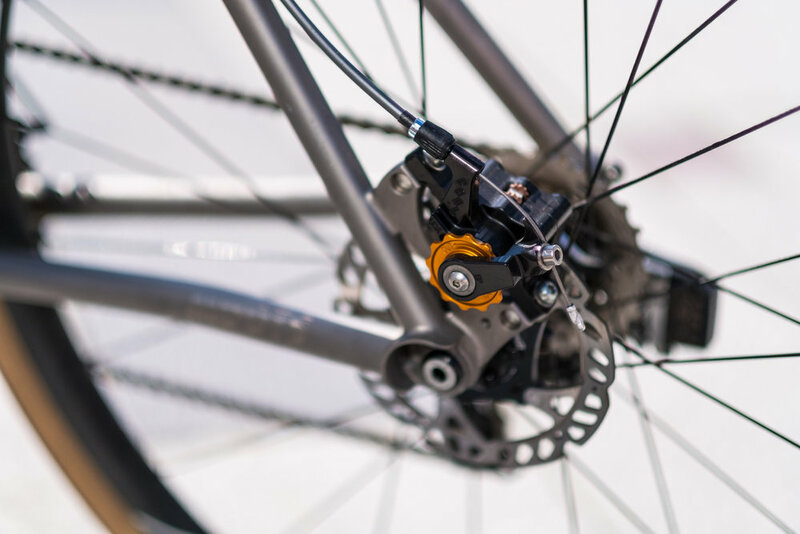 The frame is set up with external routing for mechanical derailleurs and my choice of cabled or hydraulic disc brakes, and in keeping with the rest of the bike, the braze-ons are special. They’re tapered ever so slightly end to end, with nicely rounded edges. Look how smooth that cable guide is! 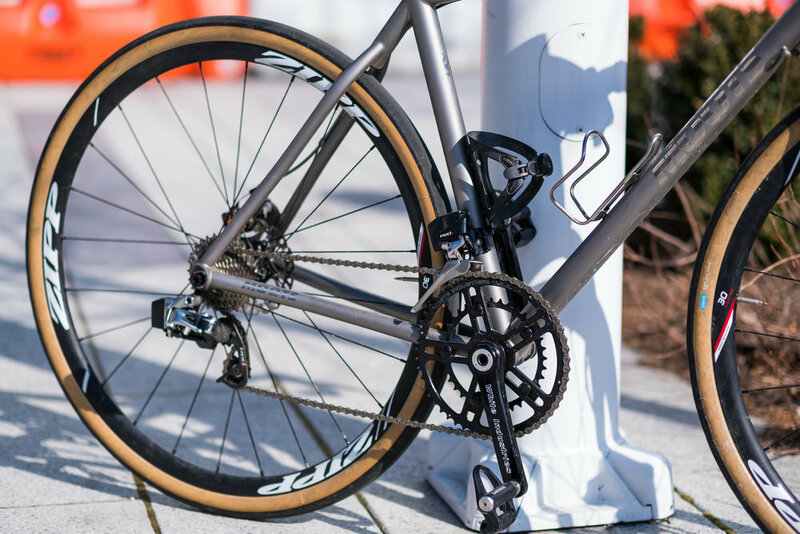 For this build, I was looking to create something of a do-it-all bike: something that would be race-able on the road, but could easily handle an adventure ride or even a cross race if my Garneau Steeples weren't available, heaven forbid. For the crankset, I went with White Industries' R30 crankset and BSA BB. I'll write a comprehensive review of this impressive piece of kit another time, but for now: I highly recommend it for folks that want to be able to adjust their gear choices easily, and want something that will wear in, versus wear out. Threaded BBs are the only way, folks. 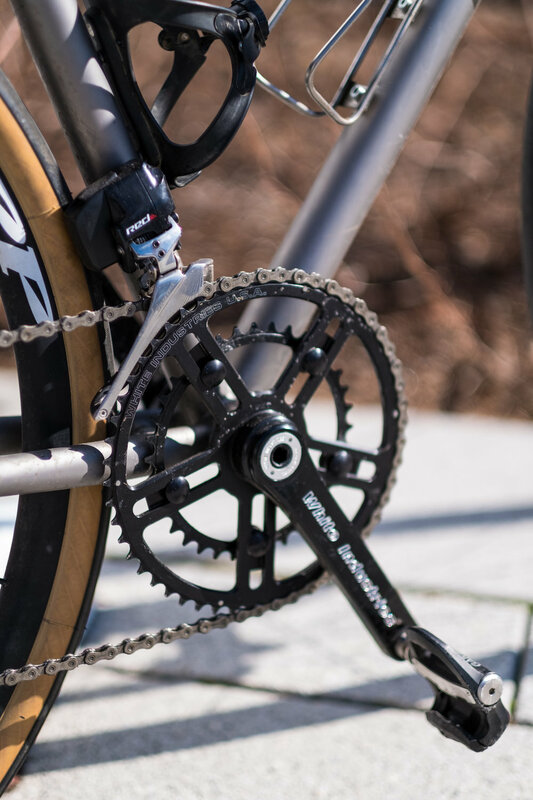 I went 52/36, which is right on the limit of what the Etap rear derailleur can manage. For cross, I’ll probably switch it over to 42/34. White Industries VBC rings go down to 24t for the inner, and 38t for the outer, in 2-tooth increments. Lots of flexibility. I pulled the Zipp 30 Course wheels from my cross bike, and stole a pair of Compass Bon Jon Pass 35c slicks from my girlfriend's bike. Plush, and not all that slow. I just got a fit from my pal Colin at ACME, so the bike is set up about as long, low and forward as a gravel bike can be, with a 140mm stem and a 0° post, all from Zipp. So far, it’s still all-day comfortable, and at least based on recent workouts, I’m making 15-20 more watts than usual, all else being equal. Get fit by a professional, folks. It makes a huge difference. My Garmin Vector 3 pedals complete the build – I think I got the only set in existence that works more than 80%, albeit with a firmware update. They are without a doubt the worst part of this bike. I wasn't sure what to expect with a Ti bike. I've ridden plenty of steel and carbon bikes, but never had a chance to try Ti. It's plenty different from both materials. 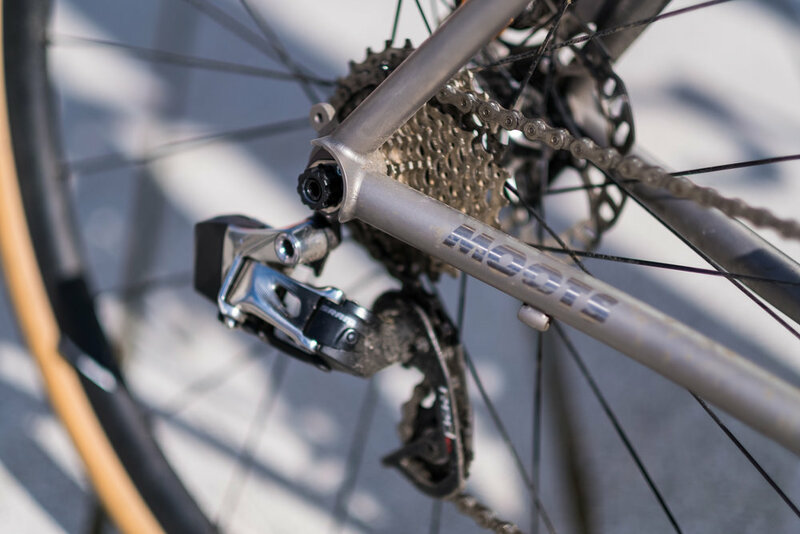 I raced (and loved) a Ritchey Road Logic steel frame in the past, and I could feel it bending underneath me during hard efforts. Even with a standard 68mm BB, I didn't feel any deflection from the Routt, even under a typically hard effort toward State Line. But I did notice an impressive amount of dampening – not compliance, really, because the chain- and seat-stays are both enormous – of road vibration, even when trialing a set of 30c tires, pumped up too high to 80psi. 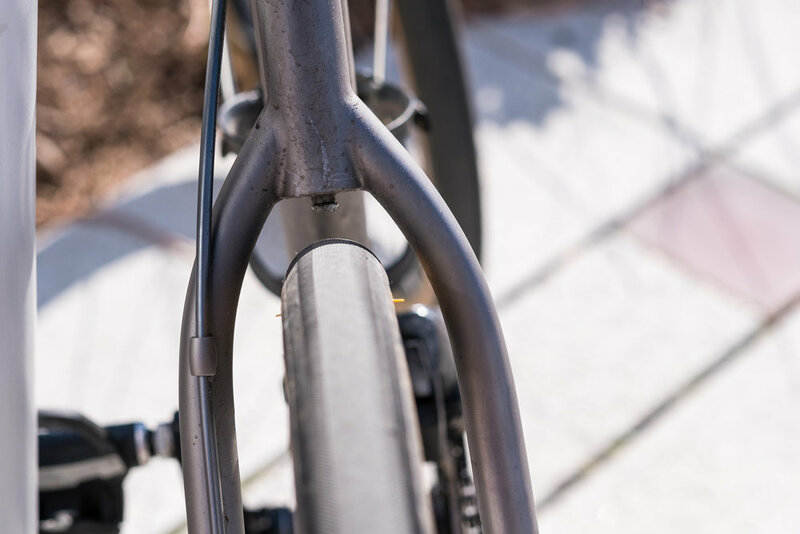 I'm normally skeptical of any superlative description of a bike frame, but yeah, Ti really does have a glide-y feel to it. It's cool. Not "throw away that bike you love" cool, but "I'd be more than happy if this was the last frame I ever own" cool. Also: I still like Di2 better, but Etap is legit. And incredibly easy to work with.